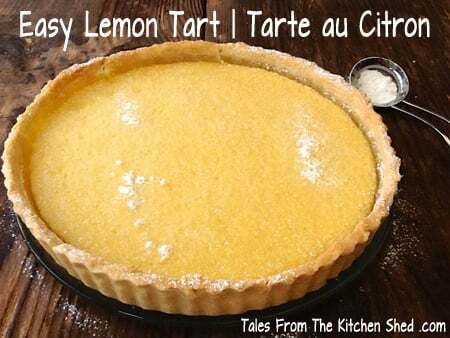 Lemon Tart or Tarte au Citron looks and tastes great and yet is really easy to make. Simply whisk together your filling ingredients, pour the mixture into a baked pastry case (preferably home-made) et voila, a delicious lemon tart ! 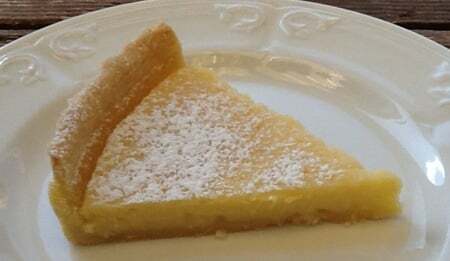 Tarte au Citron is always on the summer menu here at the Kitchen Shed as summer is when family and friends come to stay and I like to bake something special for them. As my sister’s most favourite dessert, if Tarte au Citron is on the menu anywhere you can guarantee she’ll choose it. The fresh lemon filling and buttery crisp pastry of Tarte au Citron combine to provide a perfect end to a meal – I usually serve the tart on its own but I have been known to add a few summer berries. 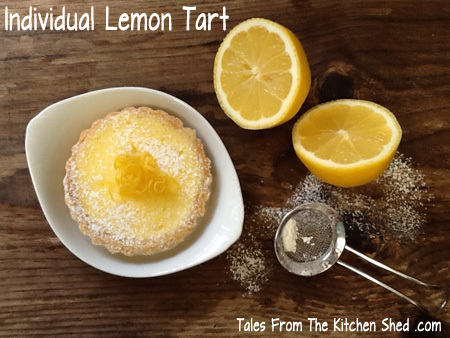 This recipe includes instructions and oven timings for both a large tart or individual lemon tarts. Sift flour and salt into the mixing bowl of the stand mixer. Add cubes of butter and mix on slow with a paddle attachment until the mixture resembles fine breadcrumbs. Add the icing sugar and briefly mix. Briefly whisk egg yolk and water in a small bowl before adding to the pastry mix. Wrap the pastry in cling film and leave in the fridge for 30 minutes until firm but not hard. Roll out your pastry to about the thickness of a £1 coin ( ⅛ inch ) making sure the pastry circle is large enough for the diameter of your flan tin plus twice its depth. Carefully line your tin with your pastry. Prick the bottom of the case with a fork and pop in the fridge for at least 15 minutes. Line your pastry case or cases with baking parchment and fill with ceramic beans, rice or dried beans. Remove from the oven and carefully set aside the paper and beans. Pop the back in the oven for 5 minutes to crisp up the bottom. Whisk the eggs, sugar and double cream together until blended. Lastly, whisk in the melted butter. Carefully pour the lemon filling into the cooled pastry case or cases. Leave to cool before removing from the tin or tins. The Pastry Challenge created by Jen at Jen’s Food & Lisa at United Cakedom, hosted this month by Jen over at Jen’s Food. Treat Petite created by Stuart at CakeyBoi & Kat at The Baking Explorer, the host for June is Kat over at The Baking Explorer. So tarts in the oven…..as so excited to taste them. A fantastic recipe as always from the shed. Just one question so I don’t spoil it. How do I know when to take it from oven is there a sign as at the moment the centre seems still fluid? Simple and delicious! Thanks for entering into Treat Petite. I saw the word lemon and had to click! Yum! This looks great. If I’m feeling ambitious this weekend I might have to try this out! Thanks Michelle. Let me know how you get on. Mmm, yummy Sarah, I adore lemon based dishes especially Tarte au Citron; so much so we had it to round off our ‘wedding breakfast’ a few years back. Thanks, my Mum gave me the small tins the other year as she never got round to using them, I’ve them a lot because they’re so cute. I would love to make something like this for my husband…. he has a thing for lemon desserts. Lovely, let me know if you make your husband a lemon tart. Thanks for popping by Joann. I’ve been craving lemon desserts lately with this pregnancy. This is so up my alley!!! You’re welcome Fionnuala. It’s really worth making your own, homemade lemon tart tastes so much better than shop bought & it’s so easy too. 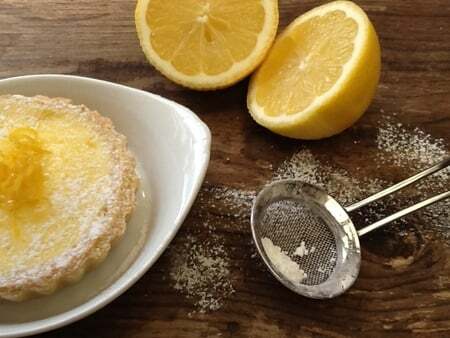 This lemon tart looks so refreshing and would no doubt bear up under Mary Berry’s inspection! 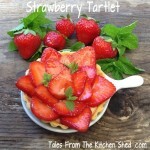 I love the idea of the individual tarts,must try these next time we have friends over. 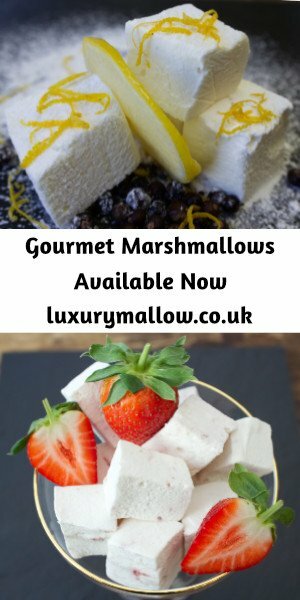 Thanks for linking up with #PerfectingPatisserie!